The top-secret information included US intelligence on Saudi royals opposing the crown prince, the report said. Shortly after meeting with Kushner, Salman began what has been described as a large-scale crackdown on corruption that has led to the arrests of more than 200 Saudi officials. Kushner has built a relationship with the crown prince and is said to be playing an important role in his visit to the US this week. 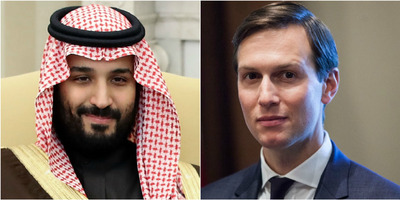 Jared Kushner discussed classified information from the president’s daily briefing with Saudi Arabia’s Crown Prince Mohammed bin Salman, who bragged that he had Kushner “in his pocket,” The Intercept reported on Wednesday, citing an unnamed source. Kushner, President Donald Trump’s son-in-law and senior adviser, had access to the briefing, a highly sensitive intelligence update meant to be seen by only the president and his top advisers, before being stripped of his top-secret security clearance last month. Before losing that access, Kushner was particularly interested in information about the Middle East, The Intercept reported, citing several former White House and US government officials. When Salman became the heir to the throne in June, the daily briefing began to focus on shifting political allegiances in Saudi Arabia and named several Saudi royals opposing the crown prince, the Intercept report said. Kushner then made a surprise trip to Riyadh in October, reportedly staying up until 4 a.m. with Salman to discuss strategy. Several sources told The Intercept that after the meeting, Salman told close confidants that Kushner had spilled the names of the Saudi royals “disloyal” to the prince – something Kushner’s camp denies strongly. A week after the meeting, Salman began what has been described as a large-scale corruption crackdown, which has led to the arrests of more than 200 officials. According to the Intercept report, Saudi officials mentioned in the daily briefings were among those detained. Kushner has developed a close relationship with Salman, setting the stage for more communication between the US and Saudi Arabia. Citing sources familiar with Kushner’s relationship with Salman,The Washington Post reported that they began their friendship at a lunch meeting at the White House last year. The two have been tasked with leading negotiations on Middle East peace and have consulted frequently in private phone calls over several months, according to The Post. A source close to Kushner recently told CNN that the relationship between Kushner and the Saudi prince was closer and more personal than others between US and world leaders, and that Kushner sought to use that bond to deepen the US’s ties to Saudi Arabia. Kushner is said to be playing an important role in Salman’s visit to the US this week. Kushner has been in official meetings with the president and the Saudi delegation and is scheduled to attend several dinners with Salman and US and Saudi officials.